So, when I was in Washington visiting the Buggy Barn, Nicole and I saw this kit for the Blackbird Designs pattern, Hallowe'en 1904. We both jumped up and down and squealed like schoolgirls, or maybe it was just me, but there was definitely nothing but smiles and joy all around. That quilt was on both our To Do Lists, we both had already bought the pattern, but up until that day had not been able to put together the fabric we needed to make that quilt. Now all we needed to do was get home, free up some time, and get to sewing. Talk about perfect timing, who wants to work on this quilt anytime of the year besides October! All the stars in the Blackbird Designs pattern, all 52 stars, are appliquéd . The quilt on display at the Buggy Barn had pieced stars, stars pieced using the Buggy Barn Crazy Way. Here's what Buggy Barn Crazy Way stars look like. This is their pattern Barn Raising, which is in the book Gone Crazy. To make the stars you stack several layers of fabric, face up, then just using 8 swipes, you cut the pieces, shuffle the pieces, and sew them all back together. If you look real close at the stars in the quilt above you'll notice they are scrappy, made by shuffling up those pieces. The gals at the Buggy Barn have used this technique to make several different sorts of blocks, like birds, hearts, and different stars. I immediately decided I wanted to make my stars like the Buggy Barn. My machine appliqué skills are not that great, I figured I would limit my lack of appliqué skills to the pumpkins. So the first thing I needed to do was to teach myself how to make the stars using the Buggy Barn Crazy method. Looking at the pattern provided in the book, Gone Crazy, I thought I needed to shrink it down to get the size I needed for the 1904 pattern. That's why I made that itsy bitsy star in the center of the picture below. That was my first attempt, it turned out great, other than the size. 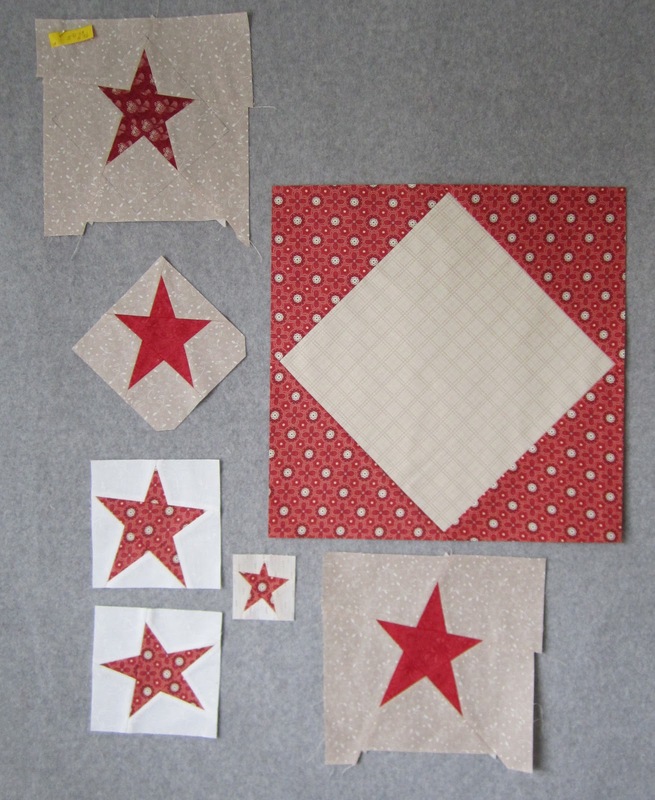 I didn't account for how much the star would shrink once pieced and trimmed. They were fun and easy to make, something different, and had a good look that went with the pattern, which filled me with relief, no applique stars for me. One thing that I came to understand while practicing my stars, the crazy method works best when you're using all the parts. What I mean is if I have two pieces of material, one red and one cream, using their method I will have the pieces for a red star on a cream background and a cream star on a red background. Well I didn't need cream stars, I needed black and orange stars. So instead of stacking and slicing each block, I figured I would save fabric by making templates of each piece that was sliced. So here's what the star looks like all sliced up. I just took the paper pattern and glued it to hard template plastic. Then I cut them out and labeled them. By piecing the stars in this fashion I will save fabric and be able to cut my pieces from strips. Here are my first two stars using the templates. So I determined that I needed 3 1/2" strips for the stars and 4 1/2" strips for the star backgrounds. For the rest of the pattern I also needed strips for the hsts and for the outer border. So I cut all my strips at once, they are hanging and ready to go. If you look real close you can see how I have each group labeled, so I don't get confused. So once I had everything figured out and cut out, the only thing left to do was sew! This is my first block. I've decided to not chain piece all the pieces for each section, then assemble all the blocks at once. I've waited so long to make this quilt I want to enjoy every block and pick out each combination of fabric for each block. My goal is to make one complete block a day. 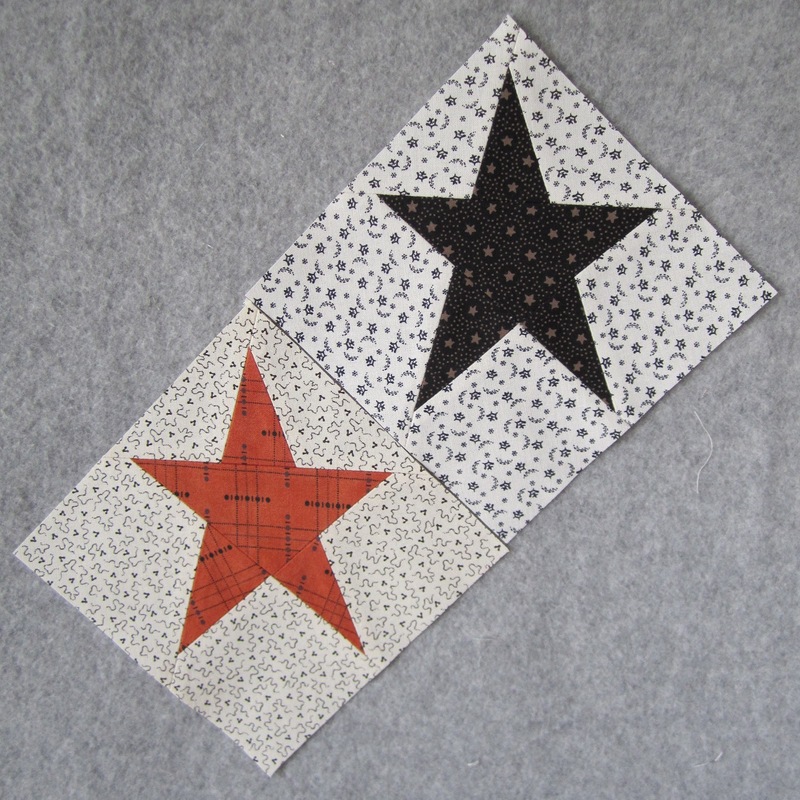 For the first block I went with 2 different blacks for the stars with two different backgrounds, and you can't tell from the picture but the outer border has a design. The top and right side hsts are the same black and background fabric and the bottom and left side are made using the same fabric, but different from the other hsts, if that makes sense. I intend to play around with the hsts on all the blocks, using different fabrics, designs, and patterns. I think the blocks in the pattern are all scrappy. You know me, I've got to plan and control my scrappy. 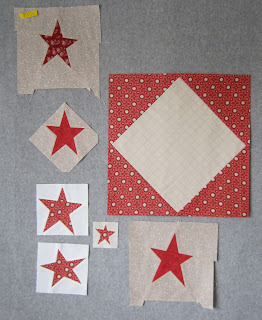 Nicole has decided to appliqué her stars and has a good start on them, check out her progress here.
" I've enjoyed your tool reviews; you covered many I wondered about,several I've never heard of and the two I do own. Next on my list is the fit to be Geese rulers...Christmas is coming and I'm starting a list! 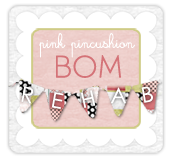 Tnks for the chance at your giveaway." The Omni-grid rulers combined, 6 1/2" square, 12 1/2" square and all the other assorted sizes were the most popular. The most popular individual ruler was the Fit to be Geese, it wasn't even close. I've got a new list of rulers that are some folks favorite that I've never even heard of! Sounds like another Tools Tuesday post will be in my future! Thanks to all who stopped by to tell me how much they enjoyed the series, I have to admit, I'll miss doing those posts too. Enjoy your weekend, if all goes well I should have a few more 1904 blocks done by Monday. I ALWAYS love this type of post where you show your process! And that orange fabric is just perfect! The crazy method of piecing the starts is brilliant. Most people will expect to see them appliqued so I'm sure quilters will find it very interested to see that it's not. Thanks for sharing this and Congratulations to jmniffer! Your stars are terrific! Thanks for sharing. Hi Thelma, 1904 is looking so good already! Its Thanksgiving up here this weekend and hockey in our family starts tomorrow, so it will be a busy weekend here. My oldest boy turned 16 yesterday and got his drivers license (and life will never be the same for me again!!lol). Take care. Very very cool! The stars look great! There are so many folks out there who are going to really appreciate you sharing how you did this! Thanks for all these tips Thelma - when I finally get around to making this pattern I will be sure to follow your advice! Ok. This makes much more sense than I imagined. I like that you used those templates. For some reason I imagined them all in one background instead of 4 individual stars. Did you have to change the size from the one in the Gone Crazy book? It looks like reducing the size made it super small. I think I'm going to need to give this method a test drive too. Thanks so much for breaking it down. I have always wanted to do this pattern, and what a fun way to do it! I love Buggy Barn crazy piecing and will definitely be doing it this way. I have this pattern and making this quilt is on the bucket list...I even have most of the fabrics! Love your stars...this may be the push that I needed!! I look forward to your progress!! Oh, your block is just so striking. I can't wait to see more progress on this! I'm loving the way you've been making your stars. Very cool, indeed. Love. Nothing but love for this quilt. Ok, so I have started a small project with the crazy piecing method...I don't know how I feel about it yet. I love the look but I felt like I could never comfortably wrap my brain around the process. I want to love it so bad...probably just need to practice it more. I probably would have chickened out and gone the way Nicole has. LOL!!! I am enjoying every second of watching your process. Wow! You are definatly a mathematical genius... as well as a great quilter. My head hurts just reading all the factors you had to take into account to make your stars... they are great by the way! Must give your method a shot... looks brilliant. Fabulous quilt and beautiful colours..... look forward to watching it progress. I love the crazy stars method. I made a Buggy Barn quilt sometime ago using this method and it was loads of fur ! Love your choice of fabrics. This is going to be one AWESOME quilt ! Love that 1904 pattern. If the quilting gods are with me this weekend, mine will finally be done! Great post! Wow, you're good! I've always been intrigued by the Buggy Barn crazy method but you explained it really well. Maybe I'll get out one of their books and start a project. Love your stars! I confess that I immediately ordered the pattern from Buggy Barn after seeing it here. I **had** to have it. So, figuring it will be gone when I get around to it, I snatched it up. 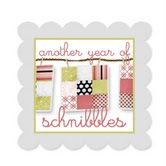 I'm normally not a primitive gal, but there is something about this pattern that just makes me smile and love it! I'm so excited to see your progress on this! I know it's going to be absolutely darling!